Blowout Sale! Free Shipping Included! 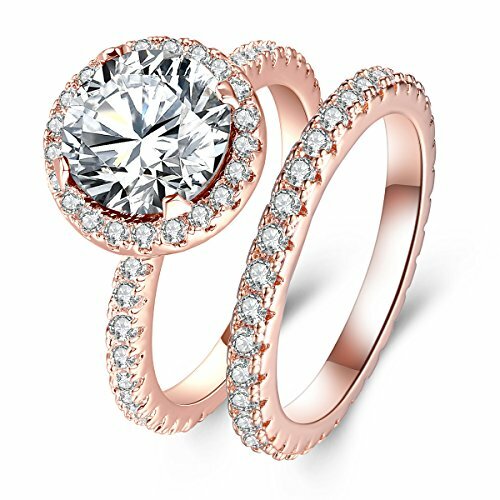 Save 91% on the 3 Carat Round CZ Solitaire 2 Pieces Ring Set for Women, Halo Style Rose Gold Plated Size 9 by Shengtai at Sherlock Coat. MPN: ST324Z-RGP-Set-9. Hurry! Limited time offer. Offer valid only while supplies last. ───✿SHENGTAI JEWELRY✿─── ✿Jewelry Is Not Only a Accessory. Every Jewelry Is Not Ordinary Because of Dream & Love, Like Our Life. ✿Jewelry Is Not Only a Accessory. Every Jewelry Is Not Ordinary Because of Dream & Love, Like Our Life. ✿This amazing ring features a elegant shining rose gold plated ring set with a striking 3 ct. Clear Cubic Zirconia round center stone (diameter: 0.36 inch), and a scintillating halo of bead-set brilliant cz stones. ✿Sparkling like real diamonds and reflect rainbow gloss in sunshine. ✿Whichever way you wear it, this ring beauty is sure to attract attention from all! ✿We are very concerned about your shopping experience, if you have any problems or questions with the product, please do not hesitate to contact us, we will do our best to help you. Look Forward to Your Feedback & Review. ✿Please avoid crash or collision. ✿Please avoid wearing it when sweating a lot, shower, sleep, etc. ✿Please avoid contacting with the acid and alkali, corrosive substances. ✿Please wipe them with soft cloth when you clean your jewelries. ❤Quality - Stunning AAA+ Clear Sparkling Cubic Zirconia and Rose Gold Plated Eco-friendly Brass, Protected with E-coat, Hypoallergenic and Nickel Free, Not Harmful for Your Health. ❤Specifications - Main Stone diameter: 0.36 inch. Diamond-like Radiance. Ring Surface Width: 0.5 inch. Matching Band Width:0.1 inch. Weight: 6-6.5 g/set. ❤100% Satisfaction Guarantee - We promise superior service which includes fast shipping, great communication, and Amazon's refund policy. STYLE IS FOR SHARING, Show Us How You Wear Your SHENGTAI Pieces! Look Forward to Your Feedback And Review! ❤Scenes - A wonderful jewelry gift for your wife, girlfriend, fiancee, mother, sister, friend, or yourself! Ideal to take this ring anytime and anywhere, at weddings, engagements, anniversary, birthday, Valentine's Day, Mother's Day, Christmas, etc. ❤Packing - A Brown Velvet Pouch. Click on Shengtai Brand Name above Title for More GREAT Items. If you have any questions about this product by Shengtai, contact us by completing and submitting the form below. If you are looking for a specif part number, please include it with your message.